Make grilling great with this handsome and functional Calais Grill Gazebo. This gazebo is a great gift to anyone who loves to grill, yourself included! 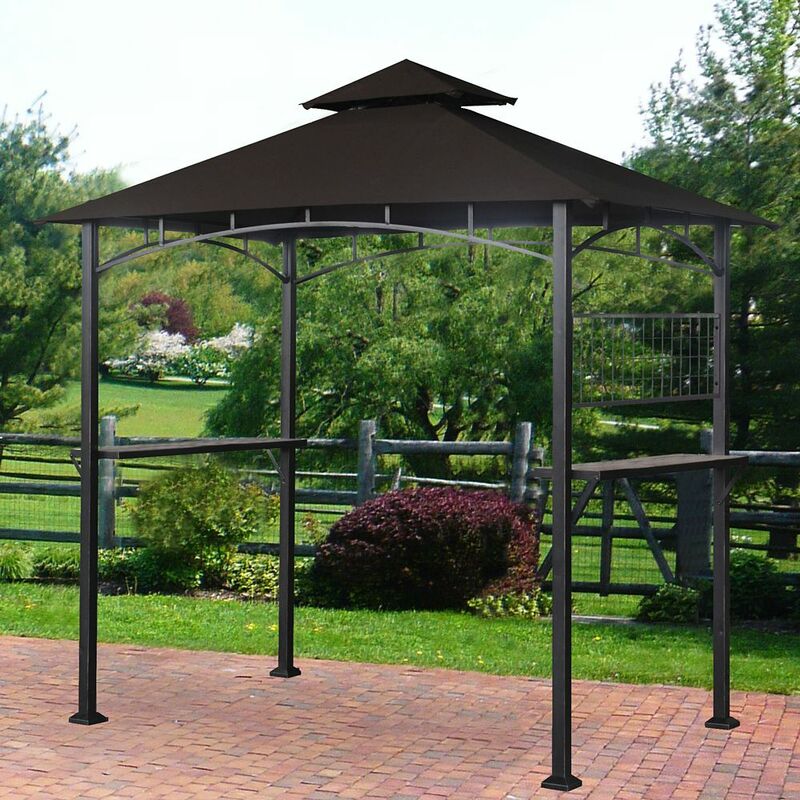 Providing shade and protection from harmful UV rays, rain, and debris this grill gazebo will help keep you comfortable while you practice the art of the grill. Don't let the elements keep you from your grill ever again! Transform your backyard, patio, or pool area into an inviting and stylish area to spend your time outdoors. The large polyester canopy provides ample shade for you to take refuge under during the hot summer months. The gazebo comes fully equipped with everything you need to create an outdoor sanctuary to enjoy a good meal or scintillating conversation. Complete with mosquito netting featuring a zippered closure, your outdoor oasis can be as peaceful as you want it to be! Beautiful two toned colour scheme is sure to please the eye. Vented canopy provides better stability in windy conditions. Sturdy steel frame with a durable powder-coated finish that is rust, corrosion, and chip resistant. Low maintenance, easy to clean. 12' x 10' footprint - plenty of room for dining or deep seating beneath. The handsome Bethany Soft Top Gazebo is the perfect addition to your outdoor living area. It's an excellent spot to set up dining or seating, and has a simple, yet striking design that is sure to please even the most aesthetically discerning critics. The two-toned valance matches the frame and main canopy, giving the whole structure a fashionable, designer look. Its clean lines ensure it coordinates easily with any outdoor furniture you already own. If you're looking to get more use out of your backyard or patio area, look no further than this remarkable gazebo the shady oasis it provides is sure to become a hotspot for friends and family alike! Don't let the weather put a damper on your grilling! Accessorize your outdoor entertaining space with this attractive Grill Gazebo with a fabric roof. Perfect as a cozy hiding place from the sun or rain, the whole steel construction has a powder-coated finish that is rust-resistant and protects against chipping. Strong, durable, built to last and versatile, decorate the textured shelves with a plant or flower or two or use for food and drinks when entertaining. Easy to assemble and and a pleasure to enjoy. Stylish, flexible, and easy to set-up, this gazebo is the perfect outdoor companion to entertain family and friends. Designed with functionality and beauty in mind, the pop-up gazebo can easily adapt to your larger guest space needs, or additional shaded surface area via its extension roof on all four sides. With its vented canopy top you are sure to be well protected from the summer heat. Its elegantly neutral colour scheme makes this gazebo effortlessly blend in with any outdoor space. Calais 5 ft. x 8 ft. Grill Gazebo with Vented Canopy Make grilling great with this handsome and functional Calais Grill Gazebo. This gazebo is a great gift to anyone who loves to grill, yourself included! Providing shade and protection from harmful UV rays, rain, and debris this grill gazebo will help keep you comfortable while you practice the art of the grill. Don't let the elements keep you from your grill ever again! Calais 5 ft. x 8 ft. Grill Gazebo with Vented Canopy is rated 5.0 out of 5 by 2. Rated 5 out of 5 by Ironman from Exactly as Advertised! A good value; solid for the price. I was able to assemble it by myself although it would have been much easier with another set of hands! Rated 5 out of 5 by DDLsouthern712 from Exactly what I wanted Even though the overall package weighed a ton, it was well packaged and somewhat easy ro assemble. Hi Goza, thank you for asking this question you have. Yes, the material of the roof is metal but the canopy itself is fabric. If you have more questions please feel free to contact our customer service hotline 1-866-578-6569 or visit us at www.sunjoyonline.com.